BANGKOK, May 16, 2010 (AFP) - Thailand's "Red Shirt" protesters appealed Sunday for UN-mediated talks with the government after several days of violent street battles in the capital left 29 people dead and more than 220 wounded. A top protest leader also urged the revered king to intervene in the crisis, which has turned areas of the city into no-go zones as troops fire live ammunition at demonstrators, some armed or using slingshots and fireworks. The Reds were ready to enter peace talks with the government "immediately" as long as the United Nations mediated, protest leader Nattawut Saikuar said. "We want the UN because we don't trust we will receive justice from organisations in Thailand," he said, as the death toll jumped by five Sunday after urban warfare erupted in the heart of the city of 12 million people. But the idea was quickly shot down by the government, which has repeatedly warned foreign governments not to meddle in its affairs. "As for the call of UN interference, no governments allow any organisations to intervene in their internal affairs," spokesman Panitan Wattanayagorn said. Previous talks between the two sides have failed to reach an agreement, despite an offer -- since withdrawn -- by the embattled premier to hold elections in November if the opposition demonstrators go home. The army Sunday put off a plan to impose a curfew in parts of the city but did not rule out restricting night-time movements if the situation deteriorates. The government extended a state of emergency to five more provinces, ordered schools to stay shut Monday and declared two days of national holidays to keep civilians off the streets. Authorities said they would send workers from the Red Cross to help protesters -- particularly women, children and the elderly -- who want to leave the vast protest area in the heart of the capital. "Men can also leave the site but they have to show they are unarmed," army spokesman Colonel Sunsern Kaewkumnerd told reporters. The army moved on Thursday to seal off the area to prevent more demonstrators entering, although they have been allowed to leave, as the government grappled with a way to end the two-month stand-off. 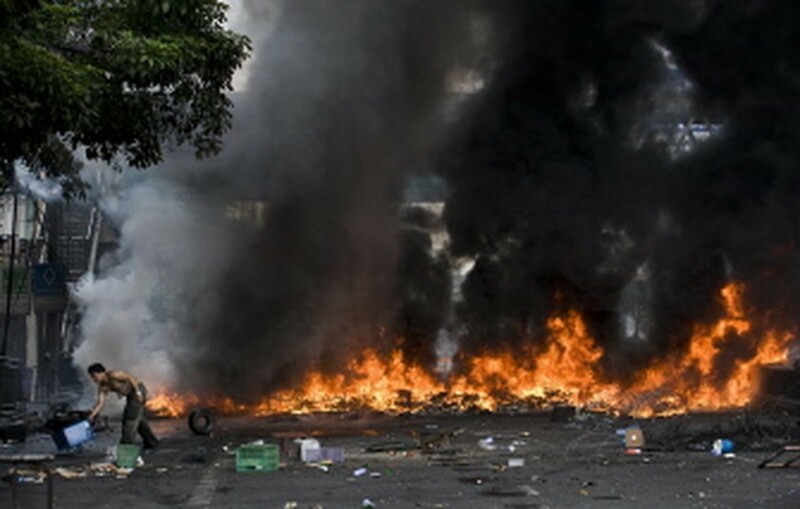 There were fresh confrontations on the fringes of the Red Shirts' sprawling encampment Sunday as a swathe of the city was shrouded in black smoke after demonstrators torched piles of tyres in roads. One shop was ablaze. Facing a military armed with assault rifles, the protesters have fought with homemade weapons including Molotov cocktails, fireworks, rockets, slingshots, and burning tyres. An AFP photographer saw one demonstrator firing a handgun on Saturday. The government says grenades have also been fired by militants opposed to the government. All of the fatalities in recent days have been civilians. New York-based Human Rights Watch said Thai authorities were on a "slippery slope" towards serious human rights abuses by designating "live fire zones." The Reds called on the king to intervene, saying he was the "only hope" for an end to the crisis, which has left 59 people dead and about 1,700 wounded since mass protests began in mid-March. "As people in this country, we would like his kindness," Jatuporn Prompan told reporters at the rally site, where thousands of protesters were camped. 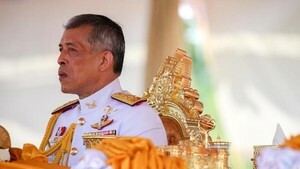 "I believe Thais will feel the same, that His Majesty is our only hope." King Bhumibol Adulyadej chastised both the military and protest leaders during a 1992 uprising, effectively bringing the violence to an end, but has avoided commenting directly on the current crisis in public. Prime Minister Abhisit Vejjajiva vowed there would be no turning back on the government's policy of sealing the protesters inside their fortified camp. "Your rally has been used by terrorists. It's not a rally for democracy," he said in his regular Sunday television address. The Reds accuse Abhisit's government of being elitist and undemocratic because it came to power in a 2008 parliamentary vote after a court ruling ousted elected allies of their hero, former prime minister Thaksin Shinawatra. The army warned it would move against the demonstrators' main rally site unless they disperse, but it gave no timetable for the action. Thai society is deeply divided between the urban elite and rural poor, with most of the Red Shirts from the north and impoverished northeast.